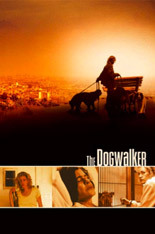 A film opens theatrically tonight in Los Angeles called The Dogwalker. I may be a bit biased as it was directed by a good friend of mine, the talented Jacques Thelemaque, and stars his wife, another friend, Diane Gaidry. It is a beautiful film, which I think will be especially appreciated by dog lovers and/or Los Angelenos. If you are here in L.A., or one of the other few cities where it is playing, go see it. It's been a long haul for this film and I'm so happy for Jacques, Diane, and the rest of the film's team that it is opening in theaters. Hmm. Looks really interesting. I hope I get a chance to see it! Diane bought her purse at BCBG on Robertson Blvd. in L.A. in early summer 2006 on sale for about $80. You can see Diane's full personal inventory of purses, hats, scarves, dresses and shoes at www.myclothesandaccessories.com./dianegaidry. It has a picture of each article of clothing and accessories that she owns along with details about each, including price, date of purchase, place of purchase and favorite outfits/uses. Actually, she needed a separate website for her shoes, so you can view those at www.myshoes.com/dianegaidry. Hey, scientists need all the help they can get when it comes to fashion. Tigger you are a good friend.